Hemel Town manager Dean Brennan has revealed that midfielder James Potton is the surprise selection to take over as captain of the Tudors following the departure of Jordan Parkes. 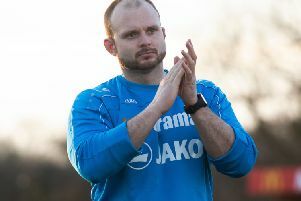 Potton was in and out of the team last season, but Brennan hopes that his new responsibilities will help him to flourish during the next campaign. “James Potton is going to be our new captain – I’ve never worked with a player with as much ability as this boy,” said Brennan. “I don’t think we have seen the best of him and I don’t think the state of our pitch helped him last season but he had five or six games on the spin where he was outstanding for us. Like his predecessor Parkes, Potton is a from the area and Brennan admitted this played a part in his selection as skipper. “We are delighted to have a local lad as captain – it’s very important to have that local influence in the squad,” said the Tudors boss. “He was surprised because he is quite a quiet lad, but I think that he gets a lot of respect within our group of players. The players all know that he has the most ability at the football club, and it’s my job to be able to get it out of him for the better of the team.